Has the spring itch got you? It’s March, can you believe it? Time for more light springy lovliness…..
With randomly placed layers of knit. A real edgy look to it. How to make your own?? Start by cutting your main piece of fabric. Mine was 33 x 12 inches (to fit a 3T-4T). Fold in half and sew along the 12 inch side. Then fold the top towards the inside a 1/4 inch and then fold down another 1.5 inches. Sew along the bottom fold using a zig zag stitch…..making sure to leave an opening to insert your elastic. Then cut strips of fabric that are 33 x 2.5 inches. (the same width as the main skirt piece). Fold in half and sew along the 2.5 inch side. I made 6 strips but you can make as many as you’d like. Turn the strips right side out and pin them to your skirt. I placed them more randomly, and pretty un-even on purpose. If you’d rather keep yours even and straight……go for it! Pin each strip with several pins all the way around. And then sew with a zig-zag stitch along the top of each strip. Then insert your 1 inch wide elastic……and sew the ends together. And let your little lady jump right in. As always, cute cute cute. I think I must make this for my little girl! This is kind of a silly question, but what kind of knit do you buy for projects like this? By the way, it is super super cute! I hope I can try it out on my daughters aged 4 and 6! Thanks so much for all of your cute cute ideas that you share! I am in awe! Hah! 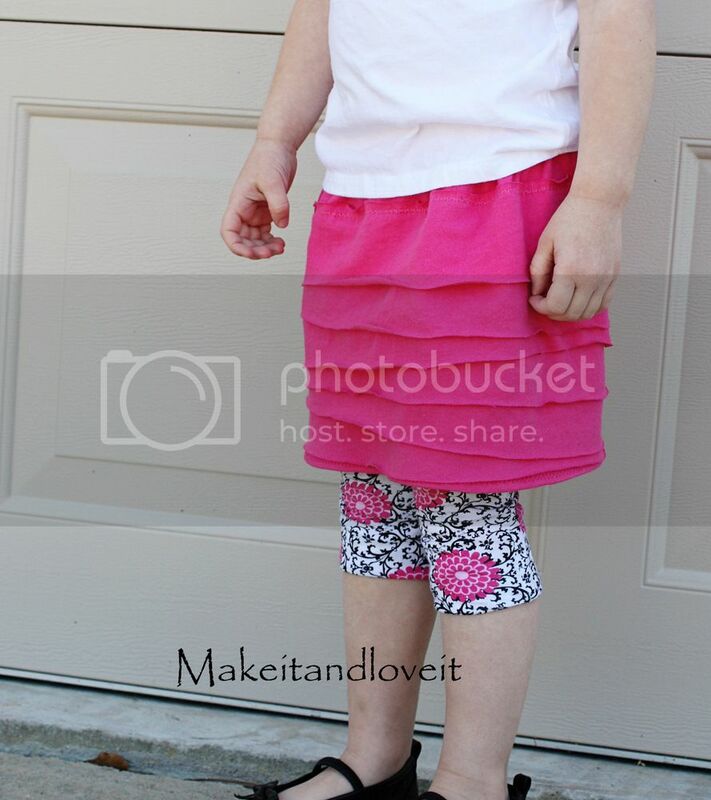 I have the same skirt but I purchased mine at the store in adult size. Good work ash! LOVE IT!!!! I have to make this one, thank you! I LOOOOOVE this!! Can't wait to make some for my little miss! TOOOOOOO CUTE! i love the leggings you paired it with too! you are so creative i just love it! Another one to add to my list of TO DOs. It's simple but so cute. 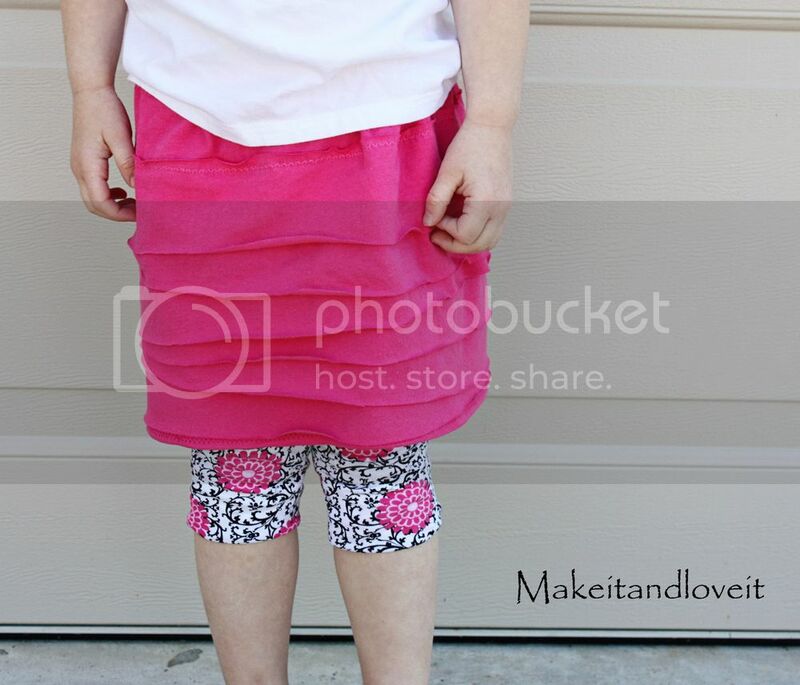 My daughter loves these kinds of clothes, so it's a must make! Thanks! I love it! i like them uneven like that too…grea job! Your ideas are inspiring! Thank you for sharing! I love this! I want one for myself. I'll be linking. Ohh I love this – you are so talented! I will have to give this one a shot. I am just starting to sew but I doubt my crooked seams would matter on this skirt! This is SO cute!! Thanks for sharing!!! :-) I want one for myself! haha! Way cute skirt! I have some little girls that would love that! I'll have to try it. cute, my daughter will LOVE this! I love your projects! 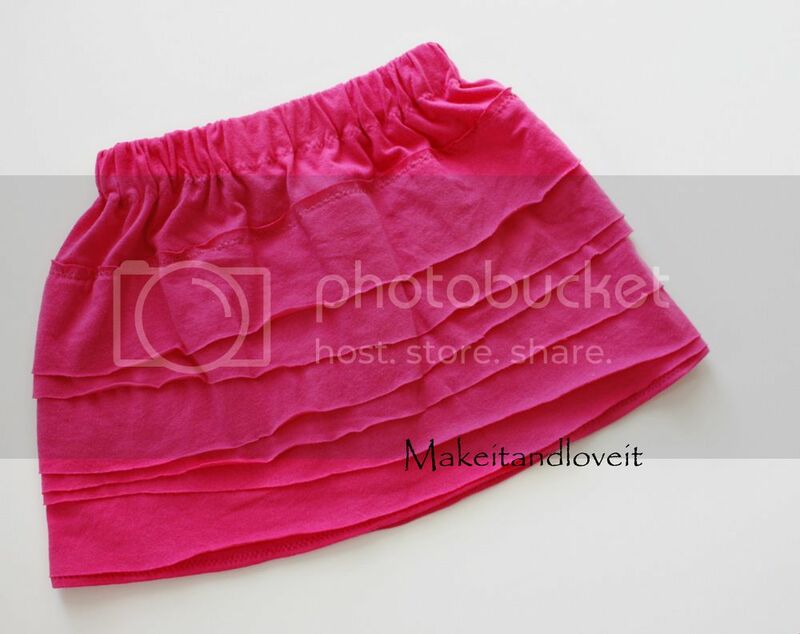 This skirt is just to cute! To bad I have no kids yet. But when I do, I will be making some of these cute clothes. And can't wait for the booties! Oh this skirt is so cute! I just found your blog! It looks great! I can't wait to see more ideas! I dont have kids, but im definitely going to make an adult version for myself. at my school we have to wear all black and it gets so mundane, but this skirt could definitely liven up my wardrobe! This skirt is so great. I can't wait to make one for my little girl! i love that. i just bought a ton of knit material at the fabric store because they were having a half price sale. now i have yet another thing that i can make out of all that material. ooh! i'm totally going to make this for myself! maybe for amelia when she gets bigger. I was wondering what size of fabric I need to begin with if I'm making my skirt for a 7/8. Thanks! I LOOOVE your blog! Ok well I have been following your blog for a few weeks now and done a ton of your little girl projects….for me lol. I don't have a little girl just a sweet little boy. All in all I still love them on me. Thanks! Could you do this by adding the strips to the material before sewing the short sides together or do you think it would cause problems? LOVE THE STYLE AND UNIQUENESS! U R VERY TALENTED! ADORABLE!!!! Cute skirt! I’m totally making one for my daughter. Just wondering… do you sew each layer on before adding the next, or do you get all the layers situated and then sew each one on?